The economic euphoria in India over the last few years, inspired by the country’s seemingly inevitable march toward double-digit growth, has suddenly soured. Although still relatively upbeat compared with many other countries, the Indian public’s confidence in their country’s direction and future economic growth has declined significantly compared with just a year ago. In a world where the Americans, the Europeans and even the Chinese have reason to worry about their economies, it is the Indians who have lost the greatest faith in their economic fortunes. Indians today are mixed in their assessment of their national economy: 49% say the economy is in good shape, while 45% describe the economy as bad. A year ago opinion was more upbeat, with a 56%-majority saying the national economy was doing well, compared with 43% who disagreed. Despite this decline, Indians remain more positive about current economic conditions than populations in most of the 17 countries surveyed in both 2011 and 2012 by the Pew Research Center’s Global Attitudes Project. And Indians are more optimistic about their economy’s trajectory over the next year than many of the publics surveyed in both years (for more, see “Pervasive Gloom about the World Economy,” released July 12, 2012). Nevertheless, the trend line in India conveys a more troubling story. Just 38% of Indians are satisfied with the way things are going in the country – a 13 percentage point decline since last year. This is among the largest drops in national contentment across the countries surveyed in 2011 and 2012. Meanwhile, the proportion of Indians who think current economic conditions are good is down seven percentage points from 2011. And only 45% of Indians think their economy will improve over the next 12 months. Such optimism has declined 15 points since 2011, again the largest falloff among the 17 nations with comparable data. A year ago, Indians’ economic mood trailed that in China, bested that in Europe and the United States, and was comparable to that in Brazil. Today, Indians’ evaluation of their current national economic situation trails that in China by 34 percentage points and Brazil by 16 points. And Indian optimism about the next year lags behind that in Brazil by 39 points and China by 38 points. Indian satisfaction with the direction of the country is descending toward that in Europe and the United States and hope for the future has been surpassed by that in America. Contrary to their view of the health and future of the national economy, nearly two-in-three Indians (64%) say their personal finances are good. This level of personal contentment is higher than in 14 of the other 20 countries surveyed in 2012. 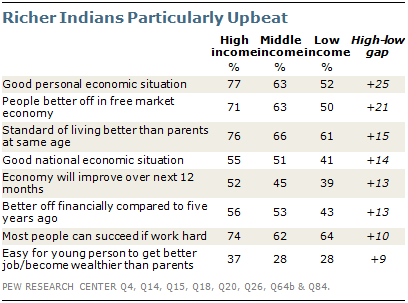 But Indians are not terribly optimistic about their children’s economic prospects. About two-thirds (66%) think it will be difficult for their kids to get a better job or become wealthier than the current generation. Such pessimism is relative, however. Among the 21 nations surveyed, people in 17 countries are even more glum about their children’s futures. Not all Indians are downbeat. By a margin of 25 percentage points, higher-income Indians are more satisfied than lower-income Indians with their personal economic situation. Richer Indians are more likely than lower-income Indians, by 13 points, to say they are better off than they were five years ago. And by nine points, they are more likely to say that their children can do better financially than themselves. These differences by income group are generally greater in India than those found in Brazil, China or Turkey, three other emerging market economies surveyed. And they exist at a time when roughly seven-in-ten (72%) Indians say the gap between the rich and the poor is a very big national problem. India’s relations with the rest of the world, especially its neighbors Pakistan, China and Iran, are increasingly important in the realm of geopolitics. But for many Indians, especially those who live in rural areas, the outside world is simply not part of their daily consciousness. Large portions of the rural population have no definite opinion about other countries, foreign leaders or international policy issues. City dwellers are more globally aware. A 58%-majority is favorably disposed toward the United States and they see America in a more favorable light than they view other major world powers, such as Russia (48%) or the EU (38%). About seven-in-ten city dwellers (71%) who say they are following the U.S. election closely want U.S. president Barack Obama to be re-elected. Only a third of urban Indians have a favorable view of China. And those who say that China’s growing economic influence is bad for India are more likely to describe relations between the two countries as hostile. There is little support among urban Indians for Iran (28%), and about half (52%) oppose Tehran obtaining nuclear weapons. Among those who oppose Iran acquiring nuclear arms, a 62%-majority favors tougher economic sanctions to prevent this possibility, and 69% believe it is important to keep Iran from acquiring a nuclear arsenal even if that means taking military action. Pakistan is a neuralgic concern for Indians. Just 13% of all Indians have a positive view of their neighbor. Nevertheless, seven-in-ten overall think it is important to improve relations, including through resolution of the Kashmir dispute (77%), increased trade (64%) and further negotiations (58%). Notably, Indians and Pakistanis share an animosity toward each other. But both want their bilateral relations to improve. These are among the key findings from a survey by the Pew Research Center’s Global Attitudes Project, conducted in 21 countries, including India. Interviews were conducted among 26,210 respondents worldwide, including 4,018 in India, from March 17 to April 20, 2012. Indians are divided in their views of 21st-century life: 49% like the pace of modern life, while 52% complain that their traditional way of life is getting lost. Roughly eight-in-ten (79%) want to shield their traditional culture from globalization. Two of every three Indians believe most people can succeed if they are willing to work hard. About half of Indians (53%) surveyed believe that it is more important for Indian society that everyone be free to pursue their life’s goals without government interference rather than the state playing an active role in guaranteeing that nobody is in need (25%). Roughly six-in-ten Indians (61%) think most people are better off in a free market economy, even though some are rich and some are poor.